Sennheiser’s Ambeo Smart Headset is an Apple Lightning powered, App-augmented earphone with microphones at the ears for noise cancellation… or binaural recordings without the need for a dummy head. The former is commonplace, but the latter is unique, and truly outstanding. The earphone is a single driver design, the size of which is not specified. It’s sonically on a par with a pair of Sennheiser’s sub-$100 earphones, which means good mid-band and high-frequency clarity and detail, but with a light touch to the bass. There are three sets of tips supplied and a good seal makes a big difference to bass performance. The Ambeo Smarts are fitted with permanently-attached earhooks that are bendy enough to be comfortable and ensure a consistent fit, but not rigid enough for sport use. Its right channel cable comes with a small in-line mono microphone for phone use. However, behind those little silver grilles on the outside of the Ambeo Smarts is where the fun really begins. That hides a pair of omnidirectional microphones. These can be used to enable an extremely potent noise cancellation system. This uses what Sennheiser calls ‘Situational Awareness’, meaning you can switch between ‘Active Noise Cancellation’ (which is very good at swallowing up the world around you) and ‘Transparent Hearing’ (which amplifies the world around you without needing to remove the earphones). Transparent Hearing is not simply a mute button; it boosts the midrange to accent articulation of voices. This is useful in an area of high ambient noise, such as trying to hear a flight attendant over a jet engine. 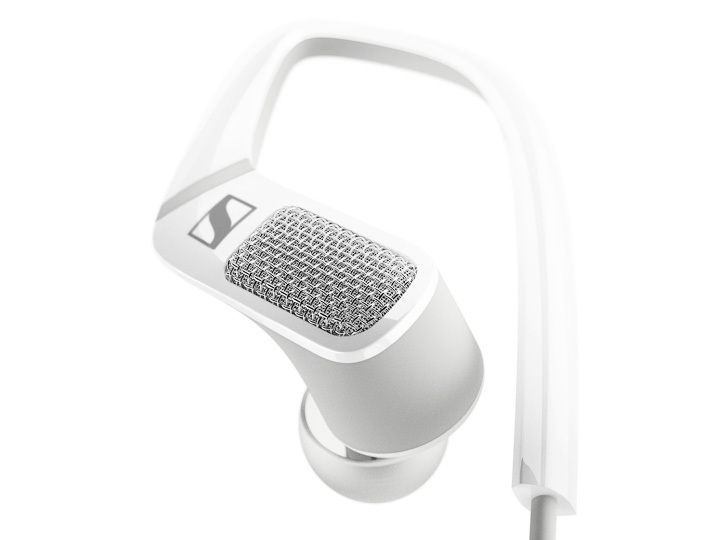 Its level is controlled by Sennheiser’s recommended SmartHeadset app, and ranges from almost no augmentation to a marked amplification – great for spies, travel, and the hard of hearing.